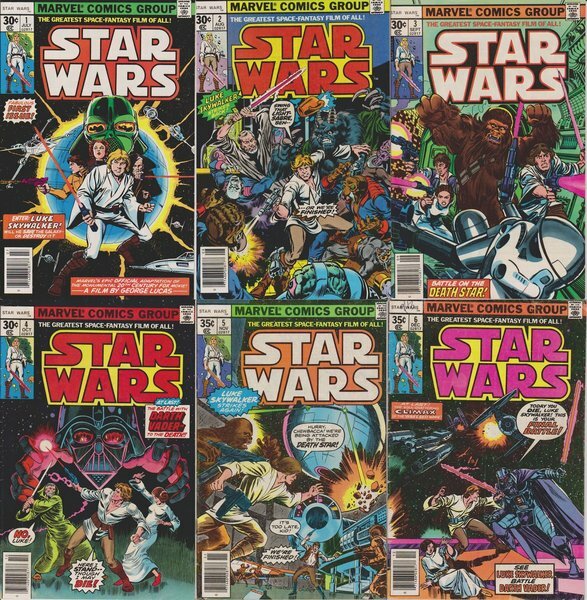 By David Konow on July 10, 2014 at 5:08 p.m.
Star Wars comics will rejoin the Marvel publishing library soon, after a decades-long stint with Dark Horse. 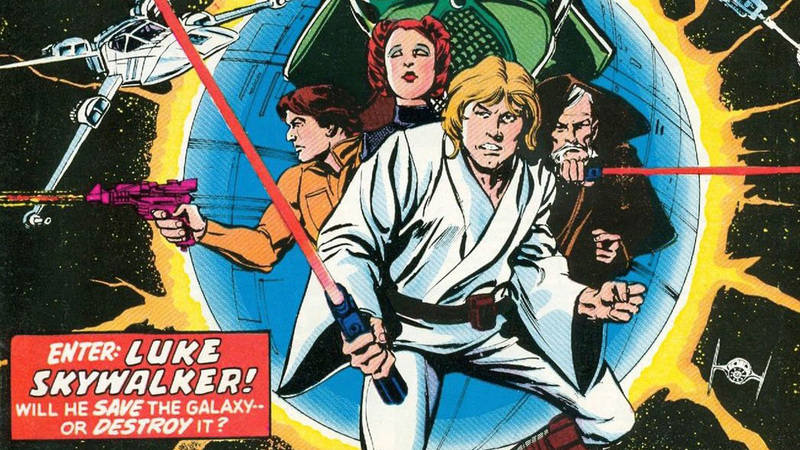 But many people don't know that Star Wars comics actually debuted at Marvel, back in 1977. Back in January, Lucasfilm announced that the Star Wars comics were heading back to Marvel, after being published by Dark Horse, who had been putting out Star Wars comics series since 1991. This wasn't a surprise because Marvel and Lucasfilm are now both under the Disney umbrella, and Star Wars comics actually debuted at Marvel way back in 1977. In a sense, it's returning home. 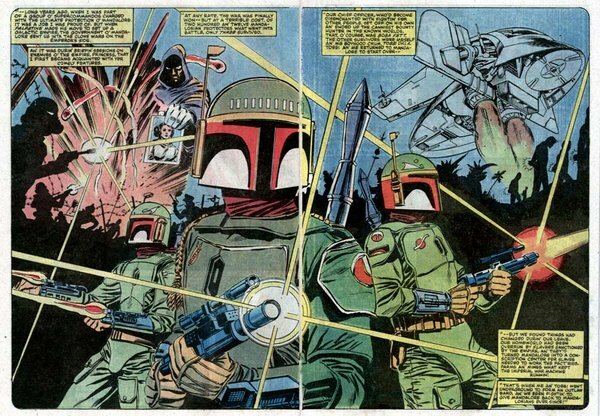 Some have credited the Star Wars comics for keeping Marvel in business back in the '70's, and it also became part of the film's enormous merchandising bonanza when the saga became a blockbuster. Before all that, however, the movie--and the comic series--were a tough sell. Roy Thomas, the former editor in chief of Marvel, remembered first meeting George Lucas and the film's publicist Charles Lippincott, in early 1975. "They were eager for any kind of publicity they could get," Thomas recalls. "I don't think there was exactly any media blitz in the works from 20th Century Fox. You'd think there would be, but it wasn't advertised much. I don't remember much about the conversation except they talked about it being a sequence of movies, and it was called The Star Wars, it still had the word 'The' attached to it." Lucas and Lippincott had already approached Stan Lee about a Star Wars comic and were turned down, so they went to Thomas to see if they could get something set up. In early 1976, they came to Thomas again, armed with the Ralph McQuarrie production sketches for the movie. "They started showing me the sketches, Charlie Lippincott flipped each one over, and he told me the story. It wasn't likely I was going to be swayed because science fiction hadn't sold very well in comics, and Marvel hadn't really done movie adaptations that much." Still, as Lippincott told the story of Star Wars, and flipped through the illustrations, Thomas's head started spinning. "It was the first time I was hearing names like R2-D2, C-3PO, Obi-Wan, Planet Tatooine…Then they flipped over to the drawing of the Cantina sequence, and I said 'I'll do it.'" As Thomas recalled, Stan Lee changed his mind when he learned Alec Guinness would be in the film. Marvel decided to do a six-issue adaption, and Lucas and Lippincott were hoping now-veteran artist Howard Chaykin would illustrate the comic. "The only problem we had was we didn't have the finished script. It had a different crawl in the beginning." Marvel felt six issues would be a good span to adapt the movie script, and Thomas recalled there were no rules about giving away the movie, unlike today, where everything in the Star Wars universe is kept top secret. "The only problem we had was we didn't have the finished script," Thomas says. "It had a different crawl in the beginning. By the time the later part of the comics would come out, the movie would already be out in theaters, and as far as revealing anything in those two or three issues, they were happy to reveal enough to get people to come out and see the movie." Rick Hoberg illustrated the first Star Wars comic with Chaykin, and he also designed the first four covers of the series. "I didn't know enough about the script other than what I had to work from, or what I was getting from the story that was already done," Hoberg says. 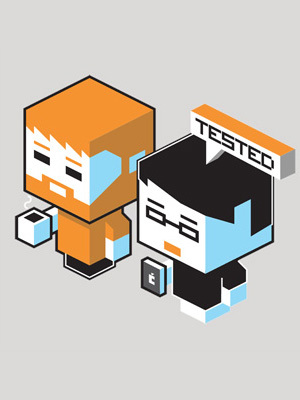 "If you look at what we did in those comic books, a lot of what we did was way off model." The biggest challenge of the first Star Wars comic was getting it finished on time, and Hoberg was called in to help. "As with most comic books, not everything ran on time," he says. "That's why there's so many fill-ins. All comic book artists fall behind along the way, and I ended up doing the finished pencils over Chaykin's illustrations." "We were really under the gun," Hoberg says. "We penciled and inked those entire twenty-two, twenty-three pages in a week. We got little or no sleep." As it turned out, Hoberg was a fan of George Lucas's previous films, and was reading about the making of Star Wars in the L.A. Times. "I was one of those people who had an interest in it because I was a fan. When I found out Lucas was going to do a space adventure, and that he was a huge fan of Flash Gordon, I took a big interest in it." Yet anyone who knows the history of Star Wars can tell you, people like Hoberg were usually the minority. One day when he visited Lucasfilm, which was then on the Universal lot, Harrison Ford came in and they struck up a conversation. "Very genial guy," Hoberg says. "He was making his money as a carpenter at this point. I told him about my interest in Star Wars and he said, 'Oh this is just a B science fiction film, that's all it's gonna be. They've got us sittin' in front of blue screens makin' all this stuff up. Thank God we have Alec Guinness here, he's making us believe all this stuff!'" The first Star Wars comic was released in March 1977, and as Charles Lippincott recalls, "We didn't really have comic book stores then. The major newsstand that carried comics in L.A. was just off Hollywood Boulevard. I went over there, and there were three beat up copies of the Star Wars comic laying on the ground. I said, 'Is this all you got in?' The owner said, 'Are you kidding? I had a stack on Friday, here it is Monday and this is all that's left!' I knew things were starting to happen, but I didn't know it would happen this fast." "It is inarguable that the success of the Star Wars comics was a significant factor in Marvel's survival through a couple of very difficult years." Some have even credited the Star Wars comics with keeping Marvel in business when the industry was in a major slump. 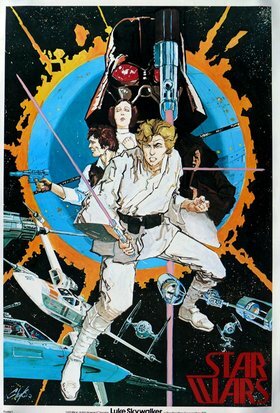 As former Marvel editor Jim Shooter wrote on his blog, "In the most conservative terms, it is inarguable that the success of the Star Wars comics was a significant factor in Marvel's survival through a couple of very difficult years…Driven by the advance marketing for the movie, sales were very good. Then about the time the third issue shipped, the movie was released. Sales made the jump to hyperspace. Not since the Beatles had I seen a cultural phenomenon of such power." "Marvel benefitted tremendously," Thomas says. "At that time, comics were having problems because newsstands and mom and pop stores were drying up. I don't know if you could call Star Wars the comic that saved Marvel, but it certainly came along at a time when it made a big difference." Thomas stayed with the Star Wars series for four more issues, then stepped away from it. Thomas liked to have autonomy with his work, he had complete freedom when he was doing the Conan series, and he didn't want to deal with anybody micromanaging him. While Lucas approved the storyline Thomas wrote for the series beyond the movie adaptation, he wasn't pleased with a long-eared rabbit character, Jaxxon, an intergalactic smuggler, that Thomas created for the comics. And the bigger Star Wars became, the more control Lucas started to exert over everything, which Thomas wasn't happy about. "I saw that Star Wars was now a sacred cow and I was never going to have any freedom with it," Thomas says. "Archie Goodwin took over after I left, and he did an excellent job with it." The Marvel Star Wars comics lasted well into the mid-eighties, with over a hundred issues released before the series went over to Dark Horse in 1991. Thomas is glad that the comic series is returning to Marvel. "I think it's nice," he says. "They never should have let it go. I think it's kind of fitting that Star Wars is coming back to Marvel, and I hope it does well for them." Likewise, Hoberg looked back on the early days of the Star Wars comics as "pure joy," and it helped him develop as an artist. "I hadn't been in the business that long, and it took a while to get my legs from underneath me and become a decent artist. I think it's great that Marvel's getting it back. "I love the Star Wars universe, and I think there's some great stories to be told," Hoberg continues. "I love the idea that they're going to make stand alone movies. I'd love to see a Han Solo movie with Chewbacca that could be like an old western, and I think Boba Fett is a great character for that kind of thing as well. He could come off as less of a villain and more of a man with no name kind of thing."